With the retired battleship USS Wisconsin as the backdrop, presumptive GOP presidential nominee Mitt Romney introduced Rep. Paul Ryan as his running mate. NBC's Peter Alexander reports. Updated at 10:45 am ET Presumptive GOP presidential nominee Mitt Romney introduced his choice as running mate, House Budget Committee Chairman Paul Ryan, 42, Saturday morning at a campaign event in Norfolk, Va.
NBC's Andrea Mitchell has the story of Rep. Paul Ryan's ascent to America's biggest political stage. Ryan then dashed onto the platform from the battleship U.S.S. Wisconsin docked at Norfolk. Ryan referred to Romney, the former head of Bain Capital, as “someone who knows from experience that if you have a small business you did build that” – a reference to President Obama’s recent statement on the campaign trail that “if you've got a business, you didn't build that. Somebody else made that happen.” Obama argued that businesses benefit from government infrastructure and public sector investments. 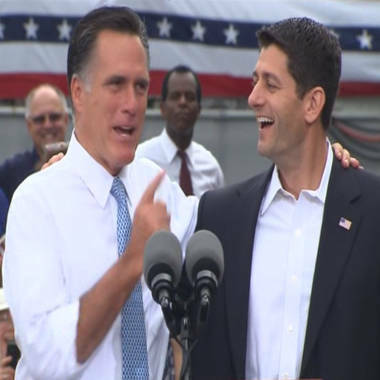 Mitt Romney and Paul Ryan appear at a campaign event in Norfolk, Va., on Saturday. A senior adviser told NBC News that Romney informed Beth Myers, who headed his search for a running mate, of his decision to select Ryan on Aug. 1. Live vote: Is Ryan a good choice? As the author of an ambitious plan to redesign the Medicare program for older and disabled Americans, Ryan has long been the target of Democratic attacks. NBC's Brian Williams takes a look at how the 2012 presidential election suddenly changed on Saturday. Obama campaign manager Jim Messina issued a statement Saturday saying Ryan's Medicare proposal "would end Medicare as we know it by turning it into a voucher system, shifting thousands of dollars in health care costs to seniors." If enacted, Ryan’s proposal would be the most far-reaching change in Medicare since the program was created in 1965. In 2011, one Democratic group ran an ad showing a man – presumably Ryan – pushing a terrified elderly woman in a wheelchair off a cliff. Ryan’s plan would gradually increase the Medicare eligibility age to 67. This phased-in increase in the eligibility age would start in 2023. Ryan’s proposal would do away with Medicare’s open-ended payments for those born in 1958 and later, (that is, people who turn 65 in 2023 or later). Presumptive GOP presidential nominee Mitt Romney introduced his choice as running mate, House Budget Committee Chairman Paul Ryan, 42, Saturday morning at a campaign event in Norfolk, Va. Instead, beginning in 2023, people in Medicare would be given a choice of private plans competing alongside the traditional fee-for-service option. Medicare would provide a payment to pay for or offset the premium of the plan chosen by the senior. The payments would be higher for low-income people and lower for high-income people. The payments would grow over time but would not necessarily keep pace with the increase in the cost of medical care. One prominent Democrat, Sen. Ron Wyden of Oregon joined with Ryan last year on a proposal to redesign Medicare. House Budget Committee Chairman Paul Ryan enters the presidential campaign as presumptive GOP nominee Mitt Romney's choice for Vice President. As part of its fiscal year 2013 budget resolution, which it approved in March, the House supported Ryan’s Medicare reform plan. The vote was 228 to 191, with no Democrats voting for the proposal and 10 Republicans voting against it. Ryan has offered some of his ideas on tax reform in interviews with David Gregory on NBC's Meet the Press. Last May, Ryan said, "What we're saying about taxes is take the tax shelters and the loopholes away from the well-connected and the well-off so we can lower tax rates for everybody so we can allow small businesses to grow and compete." Americans learned Saturday who Mitt Romney will have as his running mate, but what do we know about his choice? NBC's David Gregory and Chuck Todd reports. He also said on Meet the Press in 2011: "Instead of job-killing tax increases, why don't we just stop subsidizing wealthy people? I mean, let's go after the crony capitalism, the corporate welfare in the tax code, in spending. And why don't we income-adjust our spending programs so that we don't subsidize wealthy people as much? I think that's a better idea to get more savings in the budget, get our debt down without doing economic damage." Ryan, first elected to the House in 1998, worked in college as a staffer for Sen. Bob Kasten of Wisconsin, and later as a speechwriter for Jack Kemp and William Bennett and as an aide to Sen. Sam Brownback of Kansas. Ryan voted for the bailout of the financial sector in 2008, as well as the auto industry bailout. He also voted for the 2003 bill to add a prescription drug benefit to Medicare and has voted this year to repeal President Obama’s health care overhaul. NBC's Garrett Haake contributed to this report.